Do Fossils prove the Evolutionary Tree? [Fossils are] the most obvious and serious objection which can be urged against the theory [of evolution]. This “Fossil Record” directly correlating to the “Geologic Column” or “Geologic Time Columns”, as supposed to represent the ‘ages’ of the earth – starting with the most recent age closest to the surface, and as you move down through the strata layers of rocks and fossils – more ancient ages are supposed to be represented. Evolutionary Geologists believe that the earth has only a certain measurement of dust that accumulated per year, over time creating all the strata columns we see today in sedimentary layers. Using specific calculations and measuring backwards, they can determine the earth to be hundreds of millions of years old. This is of course assuming a uniformity of geologic deposits going back to the beginning of the earth. The opposite of the Uniformitarian’s view is the Catastrophists theory, which states that a, or multiple catastrophes, have stirred up the earth and its geologic layers to create unpredictable timescales throughout settled sediment columns of the earth. This theory and model, we will see, fits the evidence much more thoroughly. In the early 1800’s, each rock layer was given a name (i.e. Jurassic), an age and an index. This concept was thought valid by evolutionists, which therefore (without true evidence) was organized and placed in ‘textbooks’, and generally accepted by both scientists and people in general societyl! 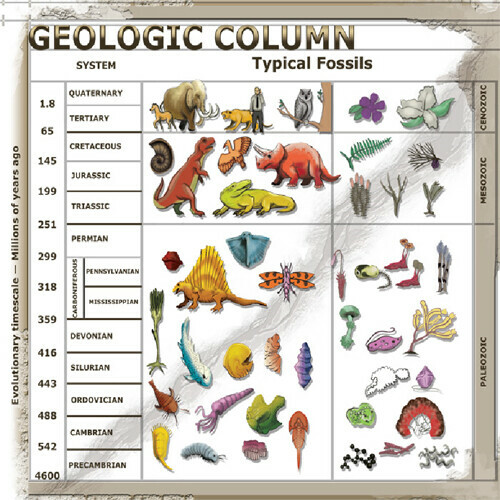 Both the Geologic Column and the Fossil Record are said by some to be the ‘Evolutionists Bible.’ The Geologic Column and the Fossil Record theoretically, are supposed to support each other. Yet there are various fossil types that show fossil records not accurately dated by the Geologic Column. 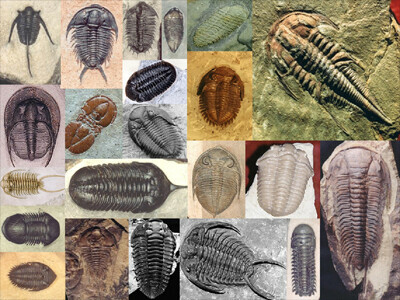 How long does it take for fossils to form? Petrifaction and fossilization, the process of organic matter becoming mineralized, was once thought by many to be a process that took thousands to even millions of years to process. 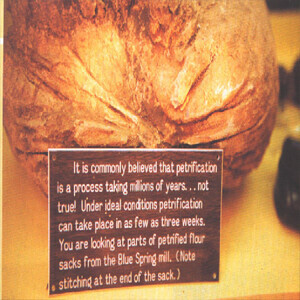 Petrification occurs through a process called per-mineralization, which typically happens when an organic substance absorbs water or a soluble liquid with a high mineral concentration, which some of the substances internal structure is then replaced by the minerals. Once believed to occurred over thousands or even millions, it is now understood that depending on different factors, such as the pH balance, temperature, and mineral saturation of the absorbed soluble liquid; “It does not take long at all”! There are multiple cases and recently produced artifacts that in the right conditions, cause fossilization to happened within a few decades or even as little as a few years. 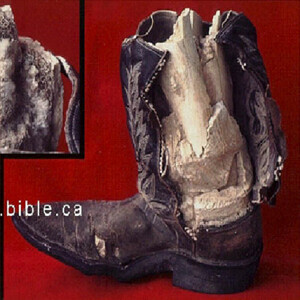 Petrified Cowboy LegA Petrified cowboy leg was found in a dry creek bed near the West Texan town Iraan, around the 1980s, by Mr. Jerry Stone (employee of Corvette Oil Company).The bones of the partial leg and foot within the boot were revealed by an elaborate set of C.T. Scans performed at Harris Methodist Hospital in Bedford, Texas on July 24, 1997. The Radiology Technician was Evelyn Americus AART. 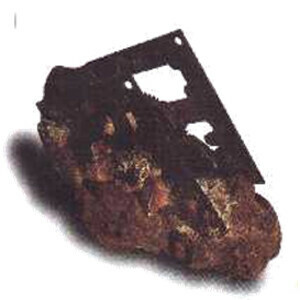 A complete set of these scans remain with the artifact at the Creation Evidence Museum in Glen Rose, Texas. 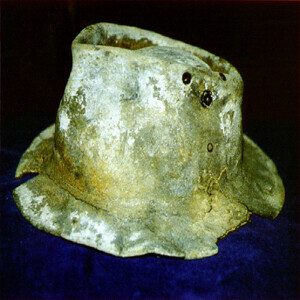 Petrified Hat Petrified bowlers hat found in New Zealand. Create Your Own Petrified…. ANYTHING!!! 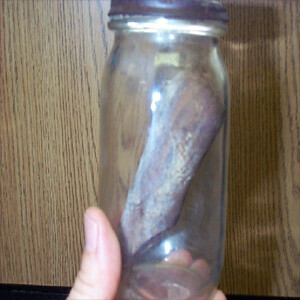 There is even a patented formula created by a chemist to create your own petrified wood. 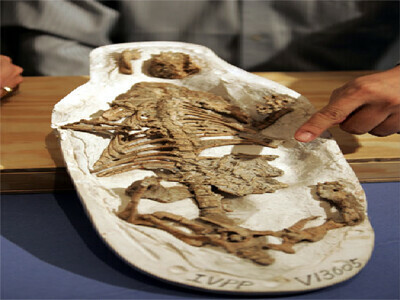 Are Fossils Evidence for the Evolutionary Tree? Evolution presumes: as you observe the higher layers of the Geologic Column, older species will “diverge” over time into new later life forms. This will cause the older organisms or ‘less evolved’ predecessors to cease to exist as they ‘evolve’ into new reproducing species. Evolutionists create a dating system from fossils using the order they are found, from top, or closest to the surface, to the bottom, in the Geologic Column of the Earth’s strata. Evolutionists state that fossils in the lower strata layers are ancestors of fossils found in the higher strata layers (i.e. 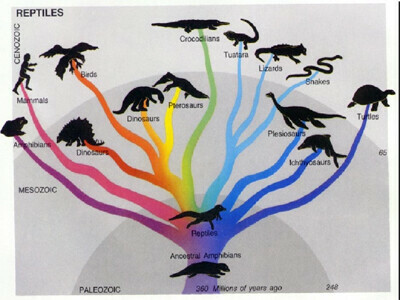 mammals evolved from reptiles because reptiles are found in the layer below the mammals). There are many problems with this assumption, as we find evidence of species traversing multiple layers. Fossils are not found in precession, so evolutionists continually make adjustments to their findings. Such as when species of one layer are without any connection to the species of a preceding layer. With so many difficulties in the evolutionary assumptions that the geologic column represents a vast timeline. The evidence ultimately found in the layers of the earths strata more readily supports the idea of a worldwide cataclysmic flood, with the bodies of the animals separated by hydrologic sorting. In China, scientist found a “dated” 130 million year old fossil from the early “Cretaceous Period”, containing a cat species with a parrot sized (about 5 in. long) dinosaur in its stomach. This evidence contradicts evolutionists beliefs that mammals evolved from dinosaurs, since we find mammal where actually preying on them and existed in the same time frame. If you found a fossil in any layer of the earths strata, by examination alone you wouldn’t know if it had any descendants or if it produced different kinds of descendants. Why do evolutionists assume they fossils they find had the ability to do something that living animals cannot do, which is to reproduce descendants different than their own kind? Similar design points to evidence for a common designer. Is the mammalian layer one strata layer above the reptile layer, every time? First of all, as shown above with the Chinese cat, evidence points to the fact that mammals ARE found throughout multiple layers, even in reptilian layers. The evidence better fits the model that, due to the facts we find a variety of assorted and mixed body densities, it is more plausible that the layers where not the result of millions of years of gathered dust debris, but rather was the result of a catastrophic flood (Noah’s Flood). based on body densities and weight, species were sorted out. – Dr. David Raup: Field Museum of Natural History, vol 50, Jan 1979, p. 25. What is a Transitional Fossil? 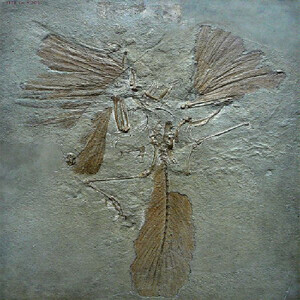 A transitional fossil is the supposed link between two different species or organisms, basically as one species had ‘transitions’ to another species. Transitional fossils is the supposed evidence of the gradual process of an organisms evolution to a new organism. The only thing people can do with this situation, as in every situation, is to study the evidence for themselves and make up their own mind what they choose to believe. Paleontologists and researchers find fossils of different species within different geologic columns. Evolutionists assume as they look at different fossils throughout the geologic columns, that lower fossils are the oldest and are the predecessors of the fossils found in top layers. Due to their own assumptions, they infer that fossils in between the top and bottom layers exist as intermediate stages of transformation or ‘transitional fossils’ as one species of organisms gradually changed into another reproducing species. 1.) First, no evidence for a ‘complete line’ of transitional fossils have ever been found for any species. To transcend from one species to another you would literally need to have hundreds of thousands of fossils completing a series from one small transformation to another. This is not to mention the additional hundreds of thousands of fossils that would need to be discovered of failed random attempts at evolutionary changes that never produced a ‘new benefit’ for the organism. 2.) Second, Micro Evolution is an observational fact that species experience small changes in their structure to better suit their environment, or to breed in/out specific genetic information (i.e. big dogs evolve into little dogs, but never into a rabbit). This suits the evidence we find in the geologic columns if/when we do find small gradual changes from one fossil to another, and explains what we are experiencing in nature today–genetic alteration in a few species to account for small changes. This is what we see in the fossils, as they remain the same kind of animal. 3.) Third, it would seem that evolutionists are ‘forcing a postulation’, as it would be easy for anyone to put a few variations of the same species in order from small to large (even though this is not found consistent in the strata) and then, take one of the small creatures on the strata below and a big creature on the strata above and say, “This is a Transitional Fossil Record”. 4.) Fourth, every transitional fossil we claim to have found, amphibian to reptile, were found to have been older examples of the complete product before the supposed transitional form. So, are there Transitional Fossils? Are there fossils that prove an evolution from one species into another type of reproducing species? If evolution where true, than all of life and every organism would be in a never ending transitional state. As evolution would be continually working, changing, and evolving every organism from one organic state to another. If evolution where true, every reproducing species would gradually ‘become’ another reproducing species, in never ending multiple procession of ‘in-between stages’. If evolution where true, everything from the first rock in the primordial soup that caused our minerals to randomly form together until the end of all life on earth is a never ending evolutionary ‘transitional’ stage. Evolutionists attempt to create lists of transitional fossils-which are eventually found to be wrong, as shown in examples below. 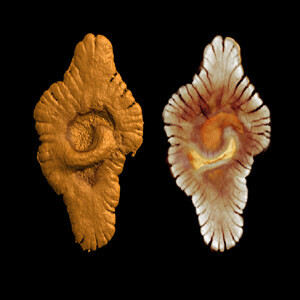 Some species have slight difference between fossils within their own species, but as discussed earlier, this is only evidence of micro-evolution. Just because a Thrinaxodon is in a strata layer beneath a lion, does not mean it was the lion’s ancestor. When we examine the evidence, we find all the information better suits the model of a catastrophic event that caused the hydrologic sorting of the organisms we find in the geologic columns. The oldest fish fossils according to the ‘geologic record,’ were found at Chengjiang, in Yunnan Province, China. There have been two species; the Haikouichthys Ercaicunensis, and Myllokunmingia Fengjiaoa said to be found dating from about 530 million years ago (mya). The time period that invertebrates where supposed to be transforming into fish according to the geologic columns was around 510 mya. These discoveries throughout the geologic strata points to the fact that fish and invertebrates existing at the exact same time. This evidence dictates, contrary to the evolutionary uniformitarian beliefs, that fish could not have evolved from invertebrates. Once again we find the evidence pointing to a global catastrophic flood; as sea creatures would all be buried first, and would be found in lower layers of piled up sedimentary layers. The Lobed Fin Fish including the Coelacanth, according to evolutionists, was the transitional species between fish and amphibian. 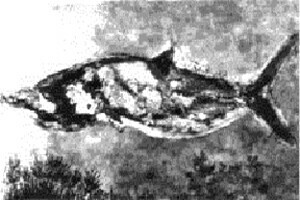 It had lobed fins that appeared to have similarities to the legs of land dwelling organisms, thus it was assumed to be an intermediate evolutionary stage between fins and legs. The lobed fin fish was believed to have existed 250 mya which at that time was progressing in its intermediate stage into an amphibian species, until it was recently discovered off the coast of South Africa. It was discovered off the Chalumna River on Dec 23, 1938; as a museum curator discovered the fish among the catch of a local angler, Captain Hendrick Goosen. It still exists in population today. 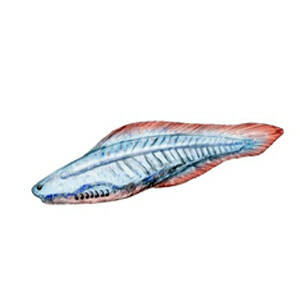 This fish was believed to have gone extinct 65 million years ago, yet today remains unchanged by evolution. It belongs to a taxonomy group known among evolutionists as the Lazarus Taxon, or species of an evolutionary line that seemed to have disappeared only to reappear much later. A Seymouria was an amphibious type creature deemed by evolutionists as the transitional stage between amphibians and reptiles. They where supposed to have lived on the earth from the time period of 280-270 million years ago. The timeframe and theory of amphibians to reptiles remained until the discovery of the Paleothyris (image to the right), which created a contradiction for evolutionists. It was dated to be from the time period of 330-315 mya. Archaeopteryx was once believed to be a transitional fossil or ‘missing link’ between dinosaurs and birds. It was a feathered reptilian creature that mostly resembled a bird, except for what seemed like teeth inside its beak and a few other dinosaur-like structural resemblances. This was until Coniferous, a modern bird identical to a crow, was discovered and found to have existed 130-150 mya (a time that was before the theoretical existence of many other dinosaur species). According to evolutionists, mammal-like reptiles supposedly transitioned between 100-125 mya, until evidence was found of full fledged mammals in China, pushing the date back to 200 mya. 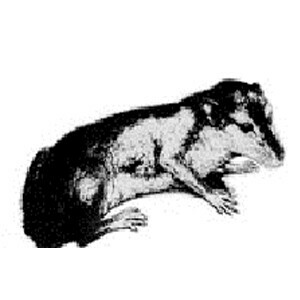 There were shrew-like small mammals, about the size of a paper clip and weighing less then an ounce, found. Looking at the data, if for over hundreds of millions of years evolution hasn’t been able to come up with something new, meaning that for over 200 million years mammals are the most recent evolutionary development, does that mean the mammal kingdom the pinnacle of evolutions random creative ability? This seems to be another contradiction, as the evolution theory demands a never ending, changing progression forward necessary to create new more efficient species. When we examine fossils, keep in mind the facts about micro-evolution, which we do often find examples of. We may find many small changes in the same species for adaptive reasons (as defined in micro-evolution, like a birds beak changing size), but no actual transitional fossils has been found showing one species transforming into another species. You would literally have to find a procession of hundreds of fossils gradually changing from one kinds of animal to another. For example, there are many ‘species’ of dogs. All the dogs that die today, if they become fossils, some future scientists might say “here is evidence of transitional stages”, but we know that dogs remain the same ‘kind’ of animal, no matter how much they physically change due to their DNA losing information. People can easily confuse small micro changes between same species fossils as a theoretical transitional fossils. As mentioned earlier, if the theory of evolution where true, all living organisms exists in an intermediate state between its previous evolution and its next evolution. The bodies of all living organisms would technically be considered a never ending ‘transition’ of intermediate body formations. If all living organisms existed as transitional forms or intermediate states, then we would expect to see the results of an incomplete organism at each stage, along with evidence of a previous existing form. This should cause, theoretically, all life forms to be covered in vestigial organs, or leftover parts from previous stages, and should be covered in newly developing tissues. We find no such evidence of the necessary hundred or thousands of vestigial organs each living creature would possess as it ‘transitions’ throughout each of its evolutionary phases. The Cambrian Explosion is the phenomenon found in the lower Geologic Column of the Earths Strata, specifically in the Cambrian layer, it is literally known among biologists as life’s “Big Bang”. This is considered another critical challenge to the evolutionary theory because evolution demands a gradual change from microbes to complex animals. The Cabrian Explosion provides evidence that complex animals existed instantaneously, as geologic columns beneath this layer have virtually no fossils or organisms. There is great diversity of life in the Cambrian Geologic Column that dates to 530 Million years ago. It contains virtually every phyla known to man and all major body plans proving these organisms coexisting simultaneously. The layers below the Cambrian strata layer have very little to no fossilized specimens; the few that are found are simple soft-body worms. Therefore we observe “NOTHING” below the Cambrian layers and the Cabrian layers themselves reveal organic complexity where different life forms ‘burst’ into existence simultaneously. Fossils do not always line up in layers at the same location; in fact, in many cases only one layer of fossils is found at a given site, as is most common with vertebrates. Where absolute depth can be considered, the pattern predicted by the geologic column does not hold. For example, there is a Jurassic site in Connecticut (Dinosaur State Park) whose fossil footprints are found at a depth of 50-100 feet, and a Cambrian site in New York with the same fossils only 5 feet deep. Such discrepancies are just explained away by evolutionists as resulting from erosion and rock movement. ‘Species Explosion’ throughout the Pre-Cambrian Layers is not the only recorded instance a phenomenon like this has been discovered. Most fossils are examples of an instant ‘explosion’ of one type of organism or another as they are found without any predecessor discovered in descending layers. 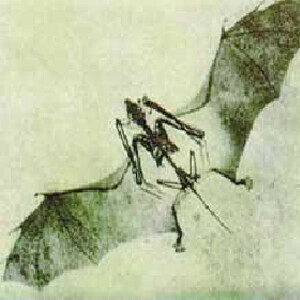 For instance the bat, the only flying mammal suddenly appears in both hemispheres in the middle Eocene layers (50 Mya) fully developed and and anatomically precocious. It has no trace of ancestors. 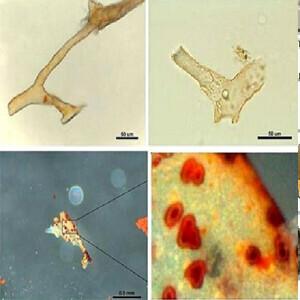 Earlier Life found and dated to be 2.1 billion years old according to Sciencedaily.com, by examining fossils found in Gabon. These prokaryotic colonial organisms are evidence of an earlier timeframe of multicellular organisms. The cambrian explosion used to be the only evidence of multicellular life, now we can date the beginning of multicellular life to as far back as 2.1 Bya. 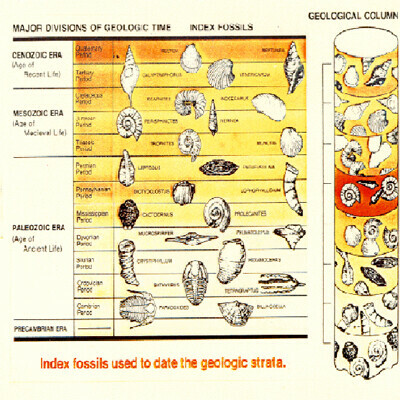 Index Fossils are used to indicate specific time periods within the geologic column. Index fossils will vary depending on what geologic column you are taking samples from and where you are in the world. They must occur in fairly reasonable quantities. Typically ‘index fossils’ are used to define the timeframe of each layer of different geologic columns around the world. Trilobite fossils make good index fossils. 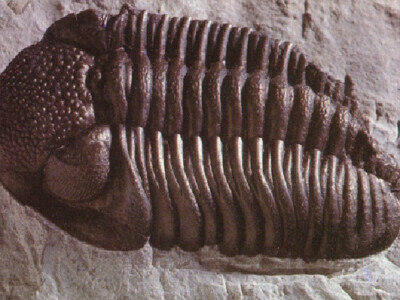 If a trilobite such as this one is found in a rock layer, the rock layer was theoretically formed 500 to 600 million years ago. 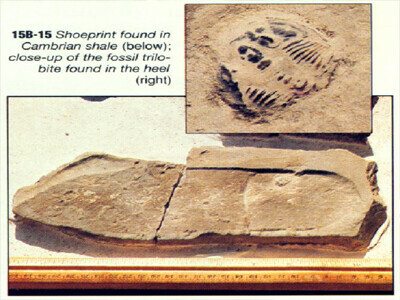 Fossilized Human Shoe Print with Trilobite Inside. The Anomalocaris, deemed by evolutionists as an index fossil, typically used to indicate the region of the Cambrian strata (542-488 mya) of the geologic column. It was later discovered in North Africa in the Ordovician layer (488-443 Mya) in Morocco. Supposing to be a fossil index fossil for 542 – 488 million years ago, it should have never been found in any different layer. This causes inconsistencies in strata dating because it is supposed to be an evolutionary conductor for the species proceeding in the top layers, neither should it any longer be used as an index fossil. 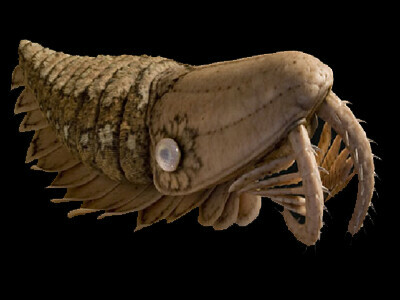 This creature was also reported in the Devonian layers (416Mya) discovered in Germany. This gives over 130 million years of age discrepancy. Additional inconsistencies are produced when we examine the evolutionary claim that this organism was a simple primitive aquatic creature. Biological observation concludes this creature was complete, not physically lacking any organic function. It was well design for hydro dynamics features unlike any other creature ever discovered, even today. 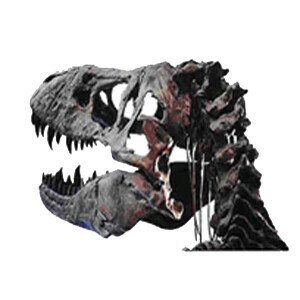 Mary Schweitzer, paleontologist at N. Carolina State University in Raleigh had stumbled upon a remarkable find while soaking a 70 million years old T-Rex fossil in weak acid. There was revealed flexible, stretchy material, red blood cells, soft tissue and transparent blood vessels. This would infer that the organic material found in these ancient fossils, due to the fact they are still so pliable are actually quite younger than previously believed. This would potentially give an upper age limit on these ancient dinosaur fossil of around 10-100,000 years old, not Millions. Mary S. is able to duplicate this process on most portions of the t-rex fossil. 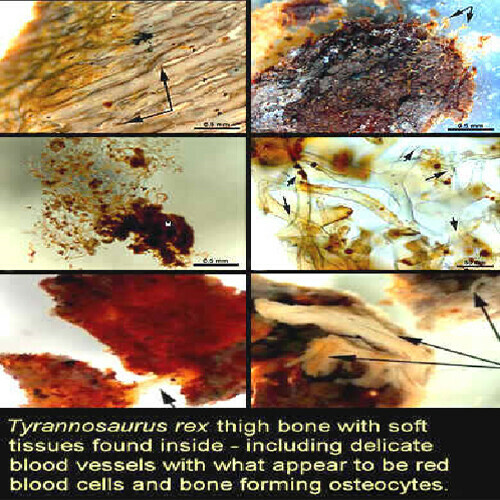 She has also been able to duplicate this process successfully on other supposedly ’80 Million year old’ fossils to reveal soft tissue and blood vessels. This raises a lot of questions. 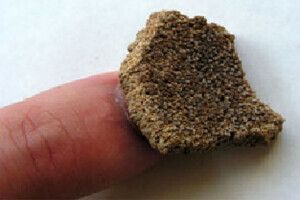 How can soft tissue exist on ancient fossils? it is impossible for soft tissue to exist past 10-100,000 years. This evidence would point to a recent creation of these animals, and that these fossils are not million but rather thousands of years old which fits the scientific discoveries perfectly. This discovery provides additional evidence that fossils we find where recently buried under a catastrophic world flood. Many other species of animals have been found alive today that match up identically to the fossil records of these ancient creatures. As far back an ancient 500 million years ago to a few hundred Million years ago, we find creature still alive today. Therefore we find most evolutionists quick to dismiss the evidence and turn the other way or simply not address the scientific method of testing such claims that finding these discoveries to be completely valid. This occurrence of finding human footprints with dinosaurs is not a once time incident, this incident is reported all over the world in multiple regions by many disciplined scientists! Paluxy River limestone has yielded many such finding dating back to 120 million years old. 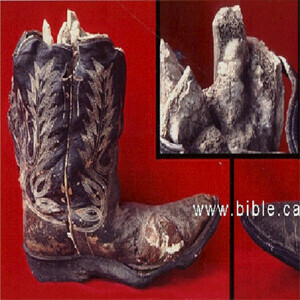 The oldest,, accepted by evolutionist, Humanoid footprint. 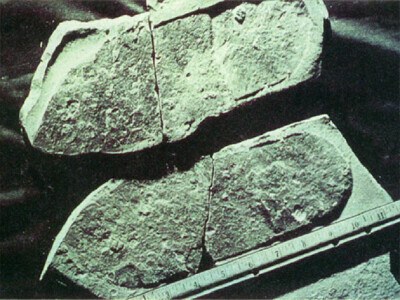 There are of course several fully accepted cases of fossilized human footprints but they all date from before Mary Leaky’s discovery of the ‘Lucy‘ footprint in Laetoli, which is estimated at 3.7 million years old. 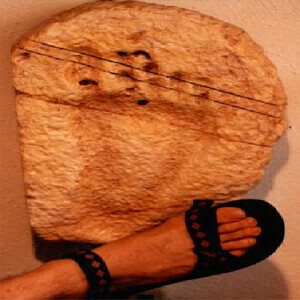 This is currently the oldest un-refuted humanoid footprint on record. All other footprint from rock strata from before this date are considered hoaxes or coincidences, or are ignored by evolutionists. Early excavations revealed human prints inside of and besides dinosaur tracks. Human footprints and handprints and dinosaur footprints where all discovered together in the same layer of the Cretaceous (145-65 Mya) rock. Cat scans and x-rays revealed density changes in the prints proving them to be authentic. In 1983 the director if Turkmenia institute of geology, prof. amanniyazov, reported finding human footprints in Mesozoic strata. 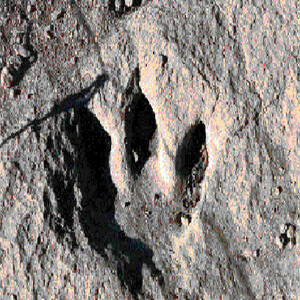 Reports of over 1500 tracks left by Dinosaurs and impressions that resembled human footprints discovered right next to the tracks. It was 26cm long, and would be basically the same as a modern man, it was found on the plateau mountains in the south-east of the republic of Russia. In New Mexico 1987, palaeontologist Jerry MacDonald discovered the Zapata track in Permian (300-250Mya) Limestone. The Robledo Mountains contains thousand of tracks of footprints and invertebrate trails. There are a number of tracks presenting problems for evolutionists, such as finding of 3 toes animals that took a few steps and looks like it suddenly “flew away” when birds weren’t supposed to exist yet, and neither are simians yet their tracks are found. Even bear tracks have seem to been found in this area in the same layers, yet all scientists agree the area is clearly Permian strata. 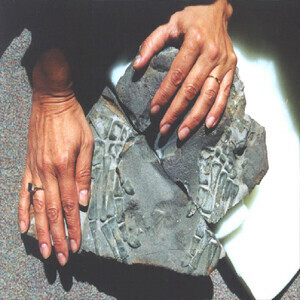 Fossilized human hands found in “cretaceous” rock near a large Ichthyosaurus (marine dinosaur) by Dr. Jamie Gutierrez in South America. A well documented discovered which has remained in the British Museum for over 50 years. In 1812 off the coast of the French Caribbean island of Guadeloupe, a full human skeleton was found, she was approx 5’2″ tall. The skeleton was found completely inside a limestone formation that weighed 2 tons, that scientists dated the formation to be 28 million years old. This was before the evolutionary theory was completed by Charles Darwin, and once it was proposed it was quickly taken down in 1881 into the museums basement where it sits today. Alvis Delk found a fossilized footprint in Paluxy river, Glen Rose Texas. He kept it for over 8 years as a common decorative item. After sometime needing some cash he cleaned it up to make it ready to sell revealing a human print “underneath” the dinosaur print. It is now in care of a creationist museum, having been documented and scrutinously tested by Dough Harris, Daniel Elif, David Lines. It has been CAT scanned, X-Rayed and all areas show it to be completely authentic. Compression ratios and density layers all match up where they should according to the estimated weight of the dinosaur that would have helped make the print. All criticisms claiming it to be a carving have been thoroughly tested and found to be negative. Archaeologist Dr. Carl Baugh found a 140 pound stone while coordinating excavations in a creek that feeds the Paluxy River in Glen Rose Texas. 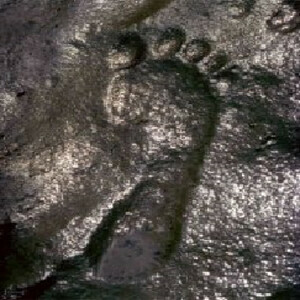 Its impression was an 18 inch long giant human print, believed to be a woman’s foot print. It is estimated she would have been aprrox 10 feet tall. Dinosaur prints where found right along side this one in the river bed in several strata layers. In July 1992 the Smithsonian Magazine clearly acknowledged the existence of many of the discrepancies between the evolutionary theory and the fossil record. They made an article proclaiming the whole issue labeling it as “what palaeontologists like to call problematic.” The magazine described what appeared to be large mammals, birds and reptiles all existing in the Permian Strata (290-248 Mya) before all these creatures should have evolved. They even acknowledge that this find is contrary evidence to the evolutionary theory, but they dared not take it one step further, and reveal the findings of human footprints next to all these other discoveries. 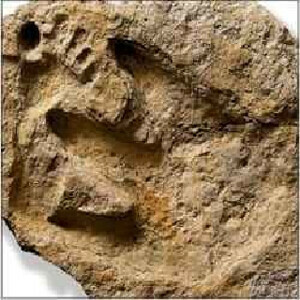 Evolutionists that disregard the evidence of human footprints found along side dinosaur footprints, have yet to come up with any reasonable refutable answers for these problems. As mentioned before they usually ignore the problem. When you read refuting documentation, evolutionists typically point out the tracks that are blurred, obscure and horribly disfigured so they can attribute the observation to be a random print made by any anonymously creature. They usually are correct because they focus their attention solely on those blurred disfigured tracks not even worth mentioning. The contradiction to the evolutionary theory comes from the tracks that evolutionists don’t want to mention because they are deeply disturbing to the evolutionists faith. Evolutionists go so far as to say these human tracks where made by some sort of prehistoric creature, or small dinosaur. Oddly enough they say this in light of the fact these are perfectly formed human footprints, obviously the same type of footprints humans make today. Are Ancient Creatures Really Outdated? Does the ancient form and design of fossilized animals reveal unevolved, unsophisticated forms that where replaced by much better systems that we find in animals today? Well besides the fact that supposed ‘ancient animals’ still exist today, or at least are considered to be ‘ancient’ by evolutionary standards, we find some of the most highly specializes physiological features in these ancient fossilized animals. Paleontologists have observed in multiple examples, researching different types of fossilized life forms that there are no ‘primitive life forms,’ meaning underdeveloped or ‘un-evolved’ life forms. Trilobites (according to evolutionary theory lived over 500 mya) had eye lens that where a doublet, meaning that it is made of two lenses unlike any found among another other animal. They literally had a better optical system then any arthropod has today. This evidence fits in a perfect creation scenario of chronological, which proves over time genetics are subject to degrading rather then evolutionary improvements. Ancient Dragonflies– same as modern dragonflies only larger. Kryostega- Dino Newt– 240Mya- 15 ft long, as complex as today’s newts. Animals found today range from simple to complex, just as we find all throughout the ‘fossil record.’ The Arthropods, amphibians, fish, reptiles, mammal all resemble all ranges of simple to complex structures in different species throughout the geologic column just as we find all around the world today. 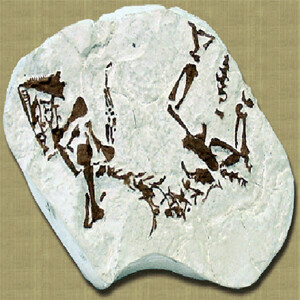 It is a well known fact that fossil do NOT form under ordinary conditions. It takes a very specific process in order for a fossil to be processed and converted from and organic material state to a mineralized state. Organic material is highly susceptible to every form of decomposition, bacteria, scavengers, weathering, and ecologic variations from the moment of death. This is why, typically, dead and decaying material rapidly becomes recycled back into the environment. Organic material must be buried very quickly in a well preserved undisturbed area in order for it to fossilize intact and remain recognizable in an original condition when it is found. We can begin to understand that the supposed ‘fossil record’ is not a timeline record at all, but is rather a record of a global catastrophic event that took place in the world. Evidence would most plausibly indicate that we find such an enormous amount of fossils throughout the world in multiple layers within the geologic columns and earth strata, where laid down very quick from Noah’s flood and continue to be so well preserved, deep within the earths sediment layers. There are thousands of fossils providing evidence to show these organisms where not preserved over the course of millions of years, but rather, they where preserved being covered and consumed very quickly in large amounts of sediment from a global catastrophe. Baleen (the filter feeder system in the mouth) in whales dissolve within hours of their death. 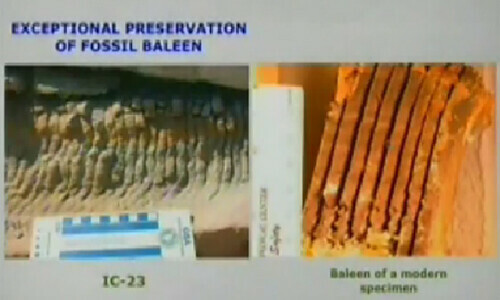 Here the baleen has been found, fossilized in the sediment. 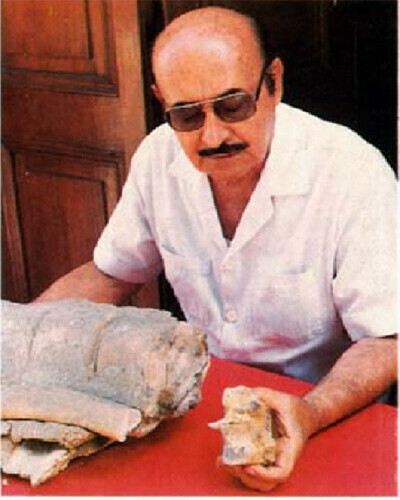 In 1999 Dr. Raul Esperante teamed up with Dr. Leonard Brand and others to investigate fossilized whales within the Pisco Formation of Peru’s Atacama Desert. This formation is approximately 600 meters thick and consists of many layers of sedimentary rock layers. Multiple whales and dolphins of the same species are found in various strata layers (dated to span a 12 million year total in differences) yet perfectly preserved with no marks of scavenging or bone decay. This could have only happened through instant fossilization especially observing the fossilized baleen that decays within hours of a deceased whale. This ichthyosaur was buried while in the process of giving birth. This is clear evidence that it must have been covered quickly in water soluible sediments, in an underwater avalance of mud. This creature shows no sign of rot or being disturbed by scavengers. Photo copyright by Staatliches Museum for Naturkunde, Stuttgart. Here we have examples of fish eating another fish while getting fossilized instantaniously. 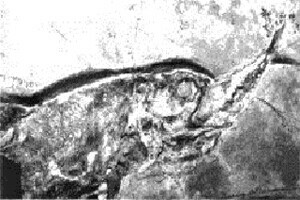 This Caturus Furcatus is seen here eating a smaller fish. This provides additional evidence of a large catatrophy that covered this fish in sediment, instantly underwater. Here is another example of a fish dated form the Mesozoic era that was instantly fossilized while eating its prey. In 1997 thousands of dinosaur eggs where found near Neuquen in Patagonia, Argentina by a team lead by Luis Chappe of the American Museum of Natual History in NY. These eggs where found alongside with the parents and the hatchlings, all together. This would indicate an instant fossilization had occurred, as large quantities of sediment and mud layers would have covered these dinosaurs while they where still in or near their nests. 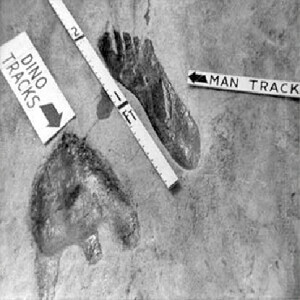 dino & man footprints- Rubstsov, “Tracking Dinosaurs,” Moscow News, No. 24, p. 10, 1983.